I trade a war story about the 22 skeg-induced stitches I once earned and how I hadn’t felt it at the time—the water numbingly cold, it takes a while before the blood and pain surface. “I live nearby, I’ll get it cleaned up, have my dad look at it,” the wounded surfer says as if his dad might be in the medical profession. “Thanks, bro.” We part ways and I head down to the water’s edge to get a closer look at the waves. There’s a good run of swell. The waves are not as huge as the stories might have you expecting, though. It’s in the head high range and A-frame peaks span up and down the long stretch of beach. Later, I meet up with an old high school buddy who has been living and surfing here for the past twenty years. “Meet me at Noriega and Great Highway, on the inside,” he texts me. 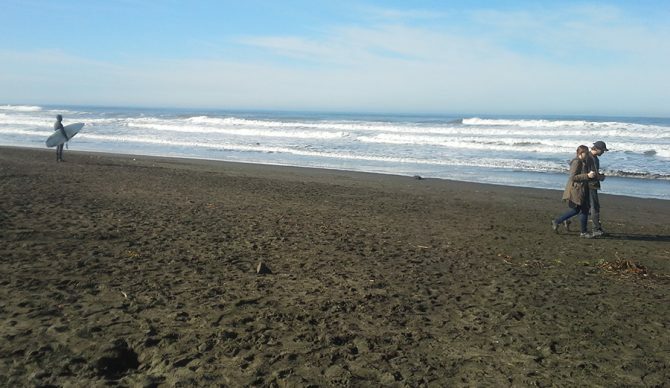 “Best sand bars!” We meet and drive a minute or two further down the coast to Sloat (the breaks are named for the adjoining streets). Richard loans me a board, some booties, and warns about the currents and how hard the paddle out to the lineup is. “I’ve pulled dead guys out of the water here,” Richard says. I make the paddle, but I don’t make the take off on my first wave. My board bounces back from the depths, still attached to its leash and agitated by the incredible open-ocean power. It socks me on the right side of the face. I paddle back out sheepishly, touching for blood, expecting it at any moment. Richard paddles over, I ask if it’s bad. Later, after coffee and slices of peanut butter honey toast in a hipster haunt and while driving back to my car, we notice that police vehicles have cordoned off the Great Highway from Noriega to Lincoln. There’s a fire truck, lights flashing, and another vehicle emblazoned SURF RESCUE waits where Noriega meets the sand. “Someone must have drowned again,” Richard says. He drops me at my car, we man-hug, make a plan to meet up again soon for another session.